This merchandise card does not perform any credit check so approval is guaranteed as long as you fill in the application form correctly. The interest is 0% when you make a purchase and hence you do not actually pay any interest at all. You also get a pretty generous unsecured credit line of $1,000. The card also reports to a credit bureau. This card can only be used at www.myuniqueoutlet.com and it is not a Visa or MasterCard. You also have to pay a $19.95 monthly fee. For some folks this could be a useful card to rebuild credit because there is no credit checks and approval is guaranteed. You also get a generous unsecured credit line of $1,000 (many subprime cards give much lower credit lines than that) to help boost your credit utilization ratio. Because there is no credit checks, those with really bad credit and perhaps even recent delinquent accounts can apply. You do need a credit card or prepaid debit card to pay your bills with this card so make sure you have at least a prepaid card. You do not need a bank account for this. 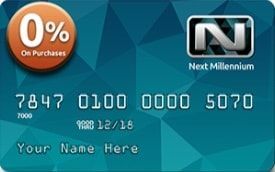 As you can see from the details above, you have to pay some fees to join the Unique Card Services membership shopping portal. You have to pay an upfront fee of $29.95. After that, you have to pay a monthly fee of $29.95. This works out to $$239.40 a year - which is quite a hefty sum). For the fees that you pay, you get benefits like free roadside assistance and opportunities to get discounts from various merchants and services. The interest rate is 0% so you do not actually have to pay interest if you pay over time on your purchases. However, this is offset by the fees you have to pay. Another interesting thing about the card is that Vast Platinum will take your monthly payment either from a credit or debit card. So I think that essentially means that those of you who are in the Chex System should be able to get this card as long as you have a debit card. This table is better viewed in landscape mode. If you look carefully at the table above, you will realize that there are groups of cards that appear to have similar fees and rates. And the reason is because that many of them are issued by the same company. For example, the Vast Platinum is issued by Unique Card Services, which also has Next Millennium and Unique Platinum. And if you look closely, they have the same fees. You get 0% APR financing, a $1,000 unsecured line, no credit checks and you have to pay a monthly membership fee of $19.95 and a one-time set up fee of $29.95. Then there are cards issued by Horizon Card Services. The include the Horizon Gold, Net First Platinum and Freedom Gold Card. They also offer 0% APR financing, a $500 unsecured line, no credit checks but have a higher $24.95 monthly membership fee. Cards from Horizon report to "one major credit bureau" which most have determined is TransUnion. You will also notice two other shopping credit cards Fingerhut and Gettington. They both have no membership fees (which makes them very cost effective. They do charge an interest if you pay over time on your merchandise purchases. But unlike all other cards, they report to all three major credit bureaus. Before we state our opinion on this shopping card, it is worth taking a step back and understand the process in using credit cards and credit lines to improve your credit. When your credit has been damaged, the first step to rebuilding is to get a secured credit card. The reason is that it is the most cost effective way in the long run (though you have to put up a deposit in the beginning - but you will always get it back when you close the account). After having a that secured card report on your file for at least six months, you could very well be approved for an unsecured credit card like Credit One. However, there are some of you with such damaged credit that you will or have been declined for secured credit cards. This is where potentially a shopping card like this may come into play. Because there are no credit checks, you are almost certainly going to be approved for it (you do need a prepaid card though to pay for your monthly membership fee). You have to pay $239.40 a year to maintain your membership. During the first year, you have to cough out an additional $29.95 just to start your account. Even my Costco Executive Membership costs only $100 a year and you definitely save with their bulk purchases. You ain't going to save any money with their products on their shopping portal. They do not report to all three credit bureaus. In fact, no way on their website does it say that it reports to any credit bureau. The purpose for getting such a card is to add another trade line to your credit report, get more credit lines and rebuild your credit. There is no guarantee this will happen. If you are considering online store accounts to add to your existing credit card (perhaps you have a Credit One), then we would suggest no annual fee membership accounts like Fingerhut that report to all three bureaus.